Sometimes you need a way to temporarily separate two dogs inside your home. Sometimes, you just need to keep one dog out of a room or prevent him from going up or down stairs for awhile. To give your dogs some freedom, yet restrict where they can roam in your house, I’d encourage you to “think outside the box”. …Try the Evenflo baby gate! Soon after we brought our new puppy home, we realized that we needed something to help us keep a closer eye on our 3 dogs, while still giving them (and us) a bit of freedom. With the Evenflo baby gate, we were able to gain a small piece of our sanity back (and get some work done), because the baby gate enabled us to allow our dogs to play separately — without having to keep our eyes glued on them at all times. Sometimes, we simply wanted a way to keep all the dogs together — within our range of sight. Other times, we wanted to be able to separate the dogs from one another — say, while they chewed on bones, or ate, or just after they’d been playing rough and needed to take a break from one another. …The Evenflo baby gate was the answer to our prayers! Who doesn’t need a way to still have some control over your pets, while giving them some freedom to roam at the same time? It’s made of wood (solid & sturdy) with rubber bumpers at the parts that actually touch the walls. The Evenflo baby gate makes a portable barrier that can be toted from room to room. It’s an unpainted wood. Plus, it appears to be loosely held together and is kind of “rickety” when you carry it from room to room. This is not a defect, just a result of its simple design, as well as the movable locking mechanism on the back. Not as “secure” as other Evenflo baby gate models might be. With the right amount of force, the gate could be pushed from either direction. This is largely due to the fact that there are pre-drilled “notches” into which the locking latch on the back rests — assuring that the gate will not spread larger or smaller, unless you physically move the latch yourself. However, if your doorway is just a tad wider than a particular notch allows for, then the gate will be a little “loose” in the doorway. On the other other hand, if your doorway is a tad smaller than a particular not allows for, then the gate will have to be “forced” tightly into position to fit within your door’s frame. Some dogs could possibly jump over it. Our full-grown lab did once… when the doorbell rang. (There are taller baby gates that work well with dogs, if you want to avoid the “jumping-over” factor.) For the most part he’s not the type to “test” his limits, so even though he could jump this gate at any time, he doesn’t. Same is true with their ability to “move” it out of the way or knock it down & enter the room they were being blocked from — it could certainly be done. But our dogs don’t “test” us in that way. The best part: Every day when I get home from work, all dogs are waiting patiently at the top of the stairs <behind the baby gate! 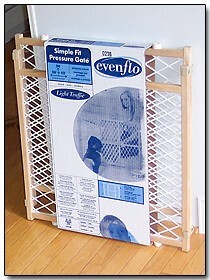 This Evenflo baby gate is the “Evenflo Simple Fit Pressure Gate for Light Traffic”. It expands right to left from 26 inches to 42 inches. Its height is 24 inches. However, if we need to be extra cautious for some reason — say, if they’re playing with Kong toys (stuffed with food), chewing on dog bones, or eating their meals, then we opt for the more secure option of locking the baby gate into place within a doorway. Oddly enough, all of our doorways appear to be different sizes — we’re only talking millimeters here, but it seems to make a difference in the locking mechanism on the back of the baby gate. We’ve found that the Evenflo baby gate locks most securely at the entry to the master bedroom. In the other two locations, we typically prop the gate up against the doorway — as a simple way to block the exit from our dogs. So, do you use a baby gate to restrict your dogs’ access to certain parts of the house?